95yo war veteran John Sato took four buses to anti-racism march. 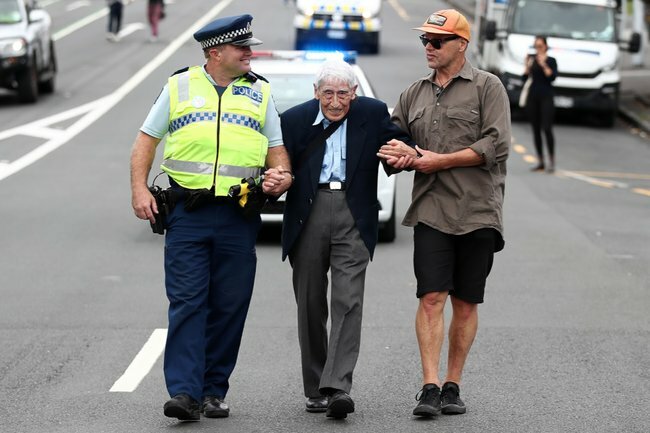 A 95yo war veteran took four buses to attend an anti-racism march in New Zealand. When 95-year-old John Sato left his house around 10am on Sunday, it was the beginning of a long journey. The World War II veteran had struggled to sleep since hearing news of terrorist attacks on two Christchurch mosques that claimed the lives of 50 people on March 15. “I didn’t sleep too well ever since. I thought it was so sad. You can feel the suffering of other people,” he told Radio New Zealand. Mamamia’s daily news podcast The Quicky shares the tales of bravery and hope after the Christchurch attacks. Post continues below audio. Sato, whose wife died 15 years ago and only daughter passed last year, heard about the vigils and memorial events around the country, and wanted to visit a mosque in Pakuranga, near his home in Howick in east Auckland. Sato does not drive, so he hopped on a bus to get there. After seeing many flowers and messages of condolences and support at the mosque, Sato decided he would attend the anti-racism march taking place in Auckland’s city centre that day – a journey that required two further bus transfers, taking his bus total to four. 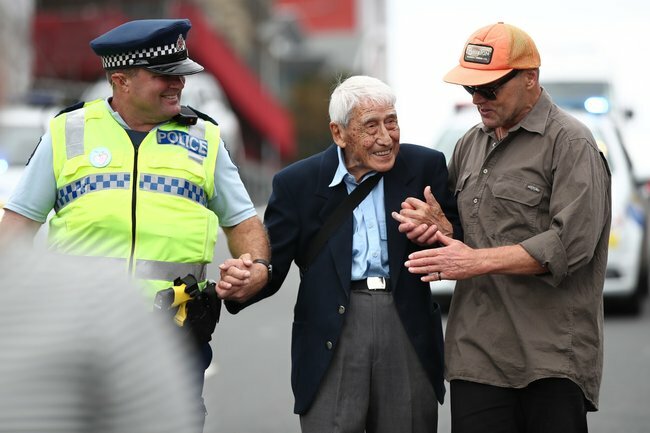 Auckland policeman Rob, John Sato and actor Bruce Hopkins walk the Love Aotearoa Hate Racism march in Auckland. Image: Getty. Moving photos captured Sato walking with the large crowd through the streets, aided by a policeman and New Zealand actor Bruce Hopkins. A policeman took him home following the march so he would not need to get another four buses. "Policeman took me all the way home, waited down there until he saw me getting up the stairs," he told RNZ. "The tragedy in Christchurch, look at what it brought out in people. It shows the best of humanity." Sato was one of just two Kiwi-Japanese men in the New Zealand Army during WWII. He said life was too short to be wasted on war and hatred and he was motivated to take part in the march to stand with his country after such a horrible event. Sato said the tragedy in Christchurch had made people realise "we&apos;re all one" and the importance of caring for each other. "I think it is such a tragedy, and yet… it has brought people together. It doesn&apos;t matter what their race or anything." "In my homeland&apos;s darkest days, I&apos;ve never been prouder to be a New Zealander." &apos;We will give him nothing, not even his name.&apos; Jacinda Ardern&apos;s powerful speech to parliament. These are the names and faces of all the known victims of the Christchurch terrorist attack. “These won’t be my best words…” Waleed Aly’s moving monologue on Christchurch.